A Marquis in GTA Vice City. The Marquis is a sailboat that appears in Grand Theft Auto: Vice City, Grand Theft Auto: San Andreas, Grand Theft Auto: Vice City Stories, Grand Theft Auto IV and Grand Theft Auto V.
The Marquis is a long single-hull sailboat with a Bermuda rig and propulsion of the motor in the rear, features that have not changed much since its introduction. Despite its design, the ship's sails are of no practical use as they are down and completely rolled up. 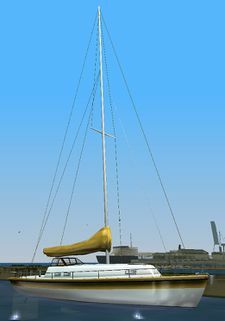 While the Marquis in pre-GTA IV games have long been depicted as a leisure sailboat, the GTA IV rendition of the Marquis sports a more luxurious design with a windowed cabin. In comparison to the former's blocky design, GTA IV rendition is also sleeker and modernized. GTA Vice City (Closer shot of hull and cabin). GTA San Andreas (Closer shot of hull and cabin). A pre-release GTA IV screenshot of a Marquis, depicting slight texture differences and two ship's wheels. GTA IV (Closer shot of hull and cabin). While the Marquis posses a streamlined hull and is common in various locations of the games, the boat is significantly slow with poor speed and acceleration (due to its underwhelming motor) and has stiff controls, making it one of the worst watercraft to commandeer in all its appearances. Docked at the Ocean Bay Marina. Docked next to Pier 69, Esplanade North. Docked near the Boat School after you have gotten all bronze or higher. Can be purchased at the docks north of the freighter in Viceport for $4500. Commonly spawns along the West River, although the ship does rarely appear in other waterways in the city. In GTA Vice City, the rear marking of the boat reads "Marquis 69, Vice City". The mission Father/Son in GTA V revolves around Michael De Santa trying to reclaim his stolen Marquis from thieves, who are towing the disassembled boat on a trailer. This page was last modified on 11 October 2014, at 09:51.